TV with Thinus: 'NO SPICY QUESTIONS': Publicist has the audacity to 'warn' entertainment media not to ask 'spicy questions' during a press conference. 'NO SPICY QUESTIONS': Publicist has the audacity to 'warn' entertainment media not to ask 'spicy questions' during a press conference. On Monday I attended a press conference in South Africa where a publicist suddenly had the audacity to tell the media literally 30 seconds before it started: "No spicy questions". Well love, I've never told you how to do your job, so please don't tell me how to do mine. Even more reprehensible is that the instruction from a South African publicist to a room full of journalists came from a former journalist. Not that I would have cared or would ever follow a publicist's order - I will ask what I want to. Interestingly, she immediately got push-back as journalists groaned and audibly balked. One shouted: "What spicy questions?" The flack said nothing further. It's shameful that a publicist would invite media to a press conference and only then suddenly want to dictate terms on what can and can't be asked. 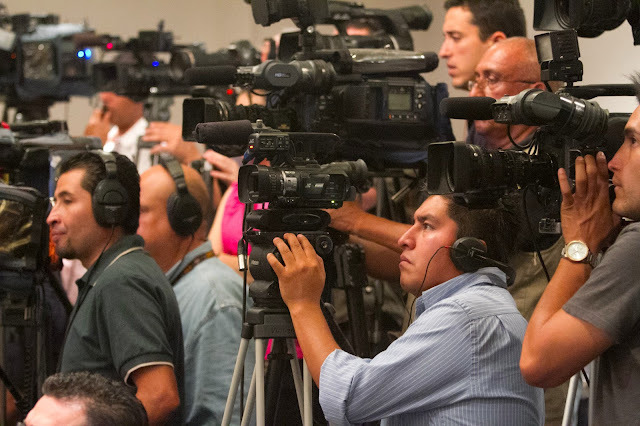 Will political reporters attending a political press conference be pre-censored? Will economic press covering business and attending an Eskom press conference be banned from asking what they want to? Of course not. Yet within so-called "entertainment reporting" it's apparently "okay" to tell journalists what they can and can't do and how they should do their job. If you want to invite me or any other journalists to a press conference and then have conditions, you need to stipulate that beforehand dear, so that we know that. And if you do invite me with strings attached, definitely know that it won't be for me to decide whether to attend your press conference - if you don't want me to ask certain questions, you can simply know and take it as a given that I/we won't be attending. I - and I assume most other journalists - are not out to deliberately ask difficult, or the most outrageous or "inappropriate" questions. We ask relevant questions, that sometimes yes, might be "difficult" because of a situation or circumstances someone created and that the media now responds to. By wanting to co-opt me to "play" journalist but to not really be the one I would be, you as publicist wants to get legitimate exposure, yet wants me as the fourth estate to collude in a fake "photo op" with moderated quotes to make you and you client or event look good. You can waste other journalists' time who regurgitate copy-paste press releases, attend "activations" for goodie bags and take only "nice" photos, but I'm never going to and neither will a lot of others. If you get (I'm not sure what term you use) "good" coverage, doesn't it feel nice to think that you really deserved it - because an event, or product or service or person is or was really outstanding? If I may also be so bold as to ask, why do you want to go to all the trouble of a press conference if you then don't actually want the media to ask questions? Years ago I was on the Grey's Anatomy set two week after the gay slur behind-the-scenes drama that saw Isaiah Washington fired, for a series of round table cast interviews. The head prefect publicist also suddenly told media not to ask any questions about tension or set, or the incident. An Australian journalist did anyway. I found myself on the Brothers & Sisters set in Los Angeles when a publicist told us not to ask Calista Flockhart any questions about Ally McBeal (another show she was in earlier), or about Harrison Ford (who she was romantically involved with). Someone did anyway, and Calista Flockhart was funny, irreverent and great and answered with a hilarious tone while she tilted her head in Ally-way that made everyone laugh: "Ally was Ally. Ally lived on a whole other planet". I will never understand why some people want press, and want to do press, but then doesn't want the press to actually be the press. I would never be so presumptuous as to tell a PR or marketing person how to do their job, yet I've experienced some of them wanting to tell me how I should do mine. When you meet the press, meet the press; don't tell them what not to ask. I will ask what I think and feel should be asked; you can choose to answer (and if so, in whatever way), or not to. But please don't try to limit my right to at least voice the question.